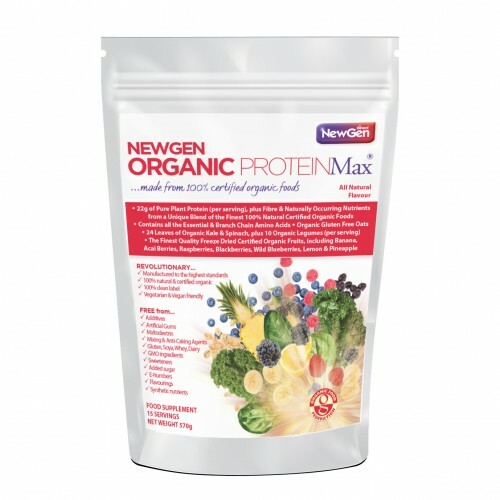 Organic ProteinMax is a revolutionary comprehensive high protein supplement, the first of its kind, made with the finest quality 100% certified organic foods. This product is outstanding, unlike most other protein based supplements, our product does not contain any added sugar, sweeteners, gums, additives, synthetic nutrients, flavourings, bulking agents, flowing agents, mixing & anti-caking agents, maltodextrin and e-numbers. This is a 100% clean product. There is no dairy, soya or whey. This incredible food supplement is vegetarian and vegan friendly, containing all 9 essential amino acids. 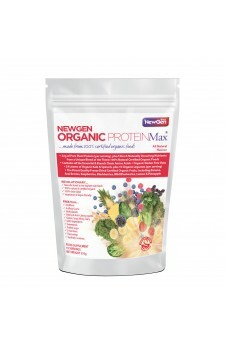 It is high in protein, a good source of fibre and this plant based formula is naturally low in salt and saturated fat. One serving contains 21.66g of protein, fibre, natural vitamins and minerals from our organic food ingredients, all 9 essential amino acids, 24 leaves of organic kale & organic spinach (per serving), 10 organic spouted legumes (per serving), gluten free organic oats and the finest quality freeze-dried organic fruits, including Banana, Acai Berries, Raspberries, Blackberries, Wild Blueberries, Lemon & Pineapple. Organic Pea Protein, Organic Banana, Organic Oats (Gluten Free), Organic Leafy Greens (Organic Kale, Organic Spinach), Organic Sprouted Legumes (Organic Haricot Beans, Organic Lentil, Organic Chickpeas), Organic Acai Berry, Organic Raspberry, Organic Blackberry, Organic Lemon, Organic Pineapple, Organic Wild Blueberry. As a Food supplement for adults, take 2 scoops (one 38g serving) once or twice a day. Mix with 4 oz. (118 ml) or more of water, juice, unsweetened rice milk, almond milk, coconut milk drink or mix into a smoothie. This is a premium 100% natural product and we do not use any mixing carriers, so please use a shaker or bottle and shake vigorously or use a blender. Alternatively, mix with food, such as natural unsweetened yoghurt. This product can be mixed into a variety of different types of smoothies or mixed to enhance and fortify foods. Do not exceed recommended dose. Food supplements are not a substitute for a healthy and varied diet and healthy lifestyle. As with all food supplements, you should speak to your healthcare practitioner before use if you are pregnant, nursing, or being treated for any medical condition. Should you have an adverse reaction to this product, please discontinue use and speak to your doctor.